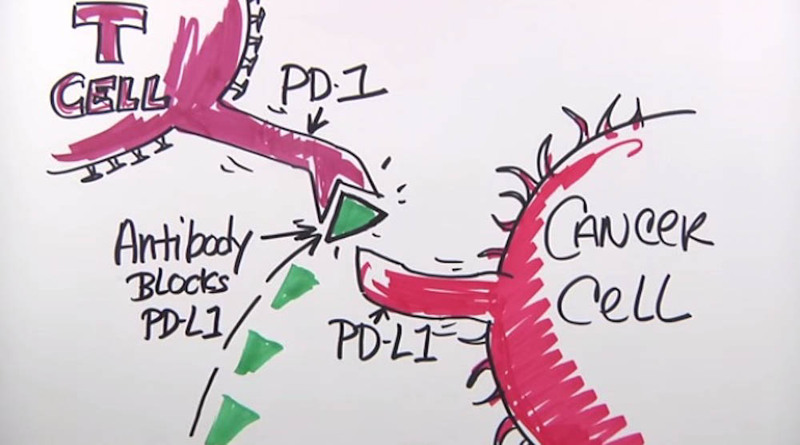 An immune checkpoint inhibitor is a drug – often made of antibodies – that unleashes an immune system attack on cancer cells. They’ve scored some impressive successes in recent years, particularly in some patients with metastatic melanoma or Hodgkin lymphoma, and are showing promise in clinical trials involving patients with other types of cancer. A checkpoint inhibitor blocks normal proteins on cancer cells, or the proteins on the T cells that respond to them. Checkpoint inhibitors seek to overcome one of cancer’s main defenses against an immune system attack. Immune system T cells patrol the body constantly for signs of disease or infection. When they encounter another cell, they probe certain proteins on its surface, which serve as insignia of the cell’s identity. If the proteins indicate the cell is normal and healthy, the T cell leaves it alone. If the proteins suggest the cell is infected or cancerous, the T cell will lead an attack against it. Once T cells initiate an attack, the immune system increases a series of additional molecules to prevent the attack from damaging normal tissues in the body. These molecules are known as immune checkpoints. Checkpoint inhibitors block these normal proteins on cancer cells, or the proteins on T cells that respond to them. The result is to remove the blinders that prevented T cells from recognizing the cells as cancerous and leading an immune system assault on them. Three checkpoint inhibitors have received rapid approval from the U.S. Food and Drug Administration for cancer, including ipilimumab (Yervoy®), pembrolizumab (Keytruda®), and nivolumab (Opdivo®). These and other immune checkpoint therapies represent one of the most promising frontiers in cancer treatment today.